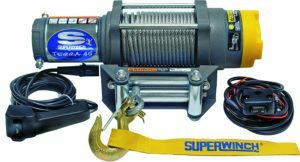 Superwinch 1145220 Terra 45 ATV & Utility Winch (4500lbs/2046kg Rating) is now available at Amazon.com for just $223.57 (REG $382.82) (As of 09 February 2019, 01:12 PST – Details) with $159.25 (42%) Savings. High-efficiency, low amp draw, sealed 1.6 hp permanent magnet motor featuring mechanical load holding and dynamic brake. 55′ of 1/4″ steel wire rope with ergonomic cam action freespooling clutch. All steel planetary gear twice as wide as those used by the competition and utilizes machined-in, oil pocket bronze bearings. Circuit breaker protected and weather sealed solenoid contact.4-way roller fairlead, heavy duty latched hook with thimble and limited lifetime warranty. Designed to be compatible with most four-bolt pattern ATV winch mount kits available on the market today, the Terra 45 is a fit for virtually any utility vehicle you ride. Along with a hefty 4,500-LB line pull rating via 55-feet of 1/4″ steel wire rope and a 1.6 hp weather-sealed permanent magnet motor powered by an easy to establish permanent connection to your vehicle battery, the Terra 45 features the power and reliability of a heavy-duty all-metal 3-stage planetary gear train. Unlike planetary gears used by competitors, its rugged all steel gears are twice as wide as those used by the competition and utilize machined-in, oil pocket bronze bearings guaranteeing smooth, uncompromised movement for years to come, no matter the weather conditions. Additional features include, a handlebar mounted switch, an ergonomic cam action freespooling clutch allowing users to quickly disengage the motor and manually draw out as much winch rope as needed, at any time, a four-way roller fairlead (mounting plate sold separately), a heavy duty latched hook with thimble and a limited lifetime warranty.